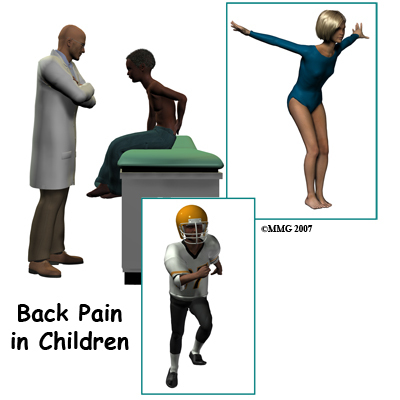 Welcome to Purposed Physical Therapy's resource on back pain in children. Until more recently, a complaint of back pain in a child or adolescent was considered uncommon. It was usually associated with a certain condition such as curvature of the spine, a broken spinal bone, inflammation, a tumor, or infection. More recently, however, reports of back pain among children are much more common. It is not clear why but may be due to children carrying heavier backpacks or sitting longer due to increased computer use. By the age of fifteen, 20-70 percent of children will report back pain but it is seldom associated with a serious condition, particularly as age increases. There are still a few cases, however, in which the pain is due to a serious condition so symptoms must be heeded. The spine is made up of a column of bones. A round block of bone, called a vertebral body, forms the biggest portion of each segment, or vertebrae. A bony ring attaches to the back of the vertebral body, forming a canal for the spinal cord. Facet joints are small joints on either side of the spine that allow motion. As the bones of the spine interlock, a facet joint is formed. Each vertebra will form two facet joints, on either side. There is a pair at the top and a pair at the bottom of each vertebra. 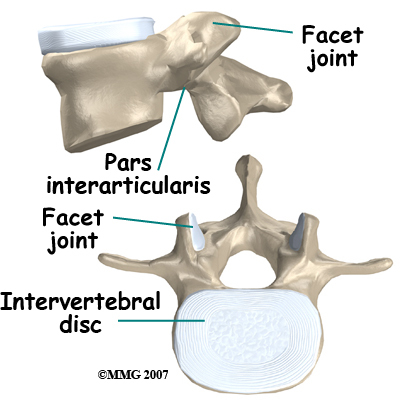 The area of the vertebra that connects the large body of the vertebra to the facet joints is called the pars articularis or pedicle. The part between the two sets of facet joints is the lamina. Intervertebral discs form a cushion between the round blocks of bone making up the vertebral body. The area where the disc attaches to the vertebral body is called an end plate. Discs are a collection of tough tissue similar to a ligament. They are filled with fluid when healthy. There are three general portions of the spinal column: The cervical or neck portion, the thoracic portion making up the mid-back, and the lumbar or lower portion. The lumbar portion connects with the pelvis at the sacrum. 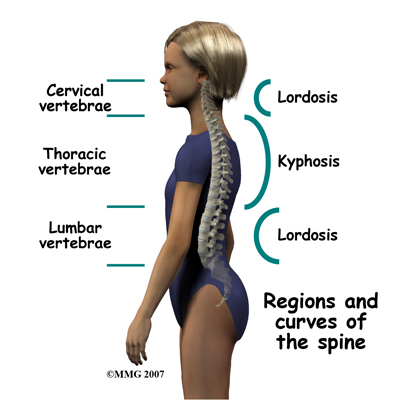 There are specific curves associated with each region of the spine. When looking from the side, the cervical spine has an inward curve called a lordosis. The thoracic spine curves outward and is called a kyphosis, and the lumbar spine normally curves into the opposite way, creating a lordosis again. These three curves maintain balance of the spine in a forward and backward plane. When there is a sideways curve in the spine (most exaggerated in the thoracic spine) it is called a scoliosis. There are several red flag warning signs that may suggest a specific cause for back pain: night pain, constant pain, or pain that spreads into the buttocks or legs are some of them. Leg weakness or bowel and bladder problems (particularly incontinence) are also red flags that can indicate nerve or spinal cord problems. Conditions that can cause back pain are grouped into nonspecific causes, meaning the cause is unknown, and specific causes/back pain, meaning there is an identified cause for the pain. With nonspecific back pain there is no specific anatomical structural reason or cause for the back pain that can be found. Approximately 60 to 75 percent of children reporting back pain will have non-specific pain. Their physical exam and X-rays will be normal. It is usually considered a muscle strain or a result of a general strain on the spine from poor posture. In some cases, non-specific back pain may be related to mood problems such as depression or anxiety. It is even sometimes related to problems at school or with peers. Spondylolysis is a fracture of the pars interarticularis or pedicle(s), usually of the L5 or last lumbar vertebrae. This injury is most likely caused by a traumatic event but it may also be caused by repetitive activity (in this case it is called a stress fracture.) Spondylolysis is a common cause for back pain in children, especially for those who are intensely active or competitive in sport, particularly at a younger age. The motions that most likely cause spondylolysis include extension (bending backwards) and rotation. Sports that put athletes at higher risk include ballet, gymnastics, football, high jumping, diving, rowing, and weight lifting but other sports can certainly cause this type of fracture as well. Spondylolysis is three times more common in boys than girls. Growth spurts and involvement in contact sports may explain the difference between boys and girls. In the early stage of the injury an X-ray may not show a fracture. Special imaging tests such as magnetic resonance imaging (MRI), computed tomography scans (CT), or a bone scan may show signs of a stress fracture. Spondylolysis may cause pain in a particular spot in the low back and spasm of the muscles along the spine. Often it will cause pain into the buttocks or thighs. Spondylolysis will often heal with the appropriate rest, a change in activity levels, and by avoiding hyperextension and rotation of the spine. Bracing may be helpful if symptoms do not get better. Spondylolisthesis is the slippage of one vertebrae on another. A spondylolisthesis can occur when spondylolysis worsens or does not heal, although a fracture does not always need to have occurred for a spondylolisthesis to be present. A spondylolisthesis can also occur as a result of a malformation of the spine at birth. Despite being present from birth, however, sometimes this slippage is not picked up until later in life when an incident of back pain is being investigated. 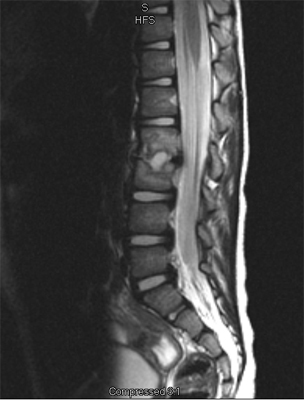 A spondylolisthesis slippage is generally graded from I through IV, one being mild, and IV being the most severe, which often causes neurological symptoms. Scoliosis or sideways curvature of the spine may be the source of back pain in some children. Most cases of scoliosis only require monitoring for worsening symptoms, along with Physical Therapy to improve muscle strength and flexibility. More severe cases, however, may need bracing or even surgery. In some rare cases a scoliosis is caused by a tumor or infection of the spine. Scheuermann's kyphosis is a thoracic spine deformity where there is wedging of three or more vertebrae in a row. Wedging means that the vertebra is wider towards the back, and narrower towards the front. The vertebra has lost its usual rectangular shape. This wedging causes increased curvature or forward bending of the spine, which is called kyphosis. The cause of the wedging is unknown. The curve from a sideways view can be 50 degrees or more. If the curvature is greater than 75 degrees, surgery to straighten the spine may be necessary. There may also be narrowing of the disc spaces between the vertebrae. Most of the time there are also Schmorl's nodes seen in the vertebral body, which are areas of disc material that bulge into the end plate. On imaging studies these look like small hollowed areas. Discitis and vertebral osteomyelitis are rare in children. 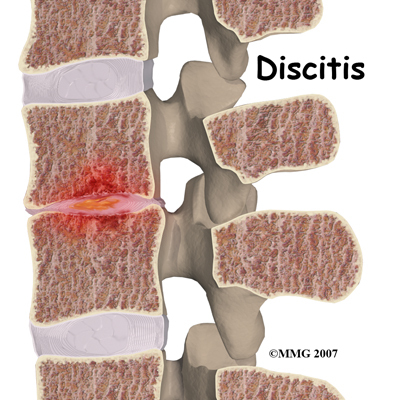 When a disc becomes inflamed and possibly infected, the condition is called discitis. If the vertebral bone becomes infected, the condition is called vertebral osteomyelitis. Common symptoms of these conditions include refusal to crawl, sit, or walk and complaints of back pain. A limp and forward bending while placing the hands on the thighs for support are also common signs. With discitis, the disc will appear narrowed on an X-ray or an MRI. Discitis usually occurs in children less than five years old. 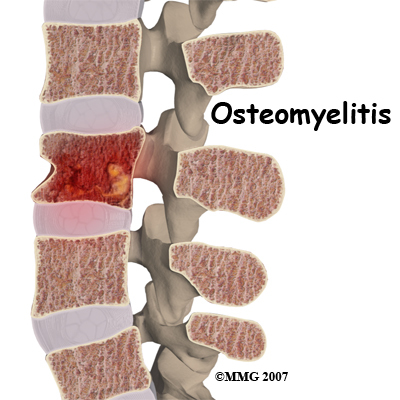 Vertebral osteomyelitis tends to affect older children and adolescents. The vertebral bone and surrounding tissue including the disc can become infected. On X-ray or MRI the bone and/or tissue can show destruction. Fever of 102 degrees Fahrenheit or 39 degrees Celsius or greater is common in vertebral osteomyelitis. 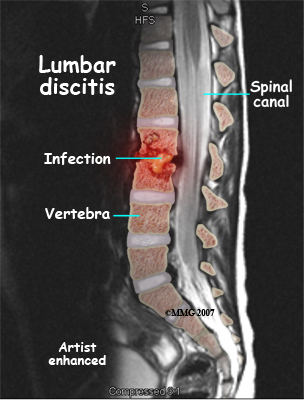 Both discitis and vertebral osteomyelitis are treated with rest, as well as oral and IV antibiotics. A brace to support the spine may be suggested. With osteomyelitis surgery may be necessary to clean out the infection and/or to stabilize the spine. Tumors are another rare cause of back pain in children. A tumor of the spine is an abnormal growth of tissue in or around the spinal column. There are many different types of spinal tumors. They can be benign or malignant. Benign means that the tumor does not spread to other parts of the body. It can still cause destruction of vertebral bone or spinal tissue. Some benign tumors can grow back after they have been removed. Benign tumors include osteoid osteoma, osteoblastoma, and aneurysmal bone cysts. Malignant tumors are tumors that can spread to other parts of the body. These include sarcoma, leukemia, and lymphoma. Depending on the age of the child, they may or may not be able to tell you about their symptoms. In a younger child, refusal to crawl, sit, or walk may indicate back pain. On initial assessment at Purposed Physical Therapy your Physical Therapist will perform an examination that will start with your child’s history. They will ask questions about when your child’s pain began, when and where precisely the pain occurs, your child’s activity levels, whether there have been any previous spinal injuries, whether there are any problems with urination or bowel movements, whether there are any muscle weaknesses, and what makes your child’s pain better or worse. They will also want to know if your child complains of pain in any other areas of their body such as their hips or knees. They may also ask questions about school and sport activities, activities at home, your child’s moods, and whether or not they have had a fever associated with their pain. A physical examination will be done once the history is complete. Your Physical Therapist will examine your child’s back to evaluate the curves of the spine, spasm of the muscles, overall posturing and alignment of the back and lower extremities, and for unusual markings on the skin or soft tissues along the spine. They will palpate, or touch along the spine and over the muscles to determine if any particular areas are painful or tight. They may push on the spine, or manually move the spine to get a general idea of how much motion is available at each segment. Your Physical Therapist will also examine your child’s hips, knees, and ankles to determine if these joints and the muscles that are involved with them might be contributing to the pain your child feels in their back. The length (flexibility) and strength of the muscles of the buttocks, the front of the hip, as well as the thigh (quadriceps and hamstrings muscles) are particularly important areas that your therapist will assess. These muscles can pull on the back if they are too tight, or not support the back well enough if they are too weak. Both tightness and/or weakness can lead to back pain. The hip joints themselves, if restricted in motion, can lead to back pain so their motion will be thoroughly assessed. The hips are designed to be mobile enough so that your trunk can turn and move freely especially when twisting or extending the spine. If the hip joints become restricted or tight there is less motion available in the joint. The decreased motion found in the hips is then often made up for by increased movement occurring in the back instead, which can lead to pain. Your Physical Therapist will also want to examine your child’s ability to bend their back forwards, backwards, sideways, as well as rotate it and to get into positions involving a combination of these motions. Your Physical Therapist will also look at your child’s posture and alignment while they are standing and sitting, and may also want to watch your child during different activities such as walking, squatting, jumping, lifting one leg, or kneeling on their hands and knees. The ability for your child’s trunk to be supported by the deep muscles of the abdominal area and back will be determined by your therapist as they observe your child performing these activities. A neurological examination may need to be done which will include checking your child’s reflexes, sensation, and muscle strength. X-rays are recommended for most children complaining of back pain due to the fragile nature of their developing spine. Views of the spine from the front, the side, and part way in between (oblique) should be taken. X-rays will allow examination of bone as well as the disc spaces. An MRI may be required if further examination of the spine is needed. An MRI machine uses magnetic waves, not X-rays, to show the soft tissues of the body. These tissues include the spinal cord, nerves, and discs. It can also evaluate spinal bones. An MRI allows your healthcare professional to look at slices of the area in question. The test may require the use of dye in an IV. Sedation or anesthesia may be needed to help your child lie still for this test. A computed tomography (CT) scan may also be ordered. This test is best for evaluating problems with the vertebral bones. Children usually tolerate this test well, however, this test exposes them to radiation, which is significantly higher than during plain x-rays. Sometimes this test may require dye in the spinal canal fluid for easier identification of the spinal cord and nerve root anatomy. When dye is injected for this purpose, the technique is called a myelogram. Bone scans, also called nuclear scans, can be used to detect fractures, bone infections, or tumors. A radioactive tracer, Technetium, is injected into your child’s vein and any area where there is an increase in metabolic activity the Technetium will show up as being more concentrated. Increased metabolic activity occurs when there is inflammation, a fracture, an infection, or a tumor. Some tumors in the spine can spread to other parts of the body, or come from cancer somewhere else in the body. A scan can be helpful to see if there are other areas in the body where the cancer may be. SPECT imaging is often added after a bone scan to provide information that is not available on routine bone scan images. SPECT stands for Single Photon Emission Computed Tomography. It provides three-dimensional (3-D) views of the area examined. Following a bone scan your child will remain on the exam table and the camera will rotate around the table while it takes pictures. SPECT imaging adds 30 to 60 minutes to the time of the nuclear scan. Sedation may be needed. A biopsy of the spine may be required if an infection or tumor is found. In some cases tissue samples can be taken with a needle but in other cases a minor surgery is needed to obtain the tissue biopsy as this allows the doctor a better view of the area he or she needs to biopsy. The tissue is then looked at under a microscope. Blood tests may be requested to evaluate the blood for specific bacteria causing an infection. A complete blood count (CBC), especially in children under the age of 10, is important as the chance that back pain is from leukemia is greater in children younger than 10. If there is an infection, the CBC may show an increase in the infection-fighting white blood cells. A C-reactive protein (C-RP) and erythrocyte sedimentation rate (ESR) may also show an increase when an infection is present. A blood culture may be necessary to help determine which bacteria are causing the infection in discitis or vertebral osteomyelitis. In some cases a biopsy may be required to determine which bacteria is the culprit. Knowing which bacteria is present will help your doctor choose the right antibiotic to treat the infection. Most treatment for back pain in children is non-surgical and involves a combination of medical treatment and close follow-up by your child’s doctor, as well as consulting with a Physical Therapist at Purposed Physical Therapy. Periodic follow-up with your child’s physician is required as repeated or different imaging studies may be necessary, particularly if symptoms do not improve. Any laboratory tests done initially may also need to be repeated. Short-term use of over-the-counter medications such as Ibuprofen may be beneficial. Weight loss may be recommended if this is deemed to be a causative factor of the back pain. Antibiotics either by IV and/or by mouth are necessary for the treatment of discitis and vertebral osteomyelitis. Treatment of non-specific back pain may include involving the school counselor or a psychologist as children may complain of back pain when they are depressed or anxious about problems at home, in school, or with peers. If your child has non-specific back pain an exact anatomical cause for your child’s back pain may not be able to be determined, however, that does not exclude the need for Physical Therapy treatment. The symptoms present can be assisted by Physical Therapy. Any muscle weaknesses, tightness, or imbalances can also be identified and treated in order to help decrease the pain but also to avoid the back pain from re-occurring. If your child is old enough then one of the first things your therapist will do is to discuss your child’s posture and alignment. Poor posture can contribute heavily to ongoing back pain. Your Physical Therapist will explain to your child about maintaining good posture and will give advice on sitting and standing postures. They will also discuss your child’s current activities and activity levels. A short period of complete rest from aggravating activities, or a period where activities are at least decreased may be needed to allow the back pain to ease. Your child’s Physical Therapist will discuss which activities are safe to continue participating in as well as those which your child may require a break from. Safe lifting techniques will also be discussed if your child is of an appropriate age to grasp the concept. During the first few appointments at Purposed Physical Therapy treatment will focus on relieving your child’s pain. Your Physical Therapist may use modalities such as heat or ice to assist with decreasing any pain or swelling in your child’s back. In some cases ultrasound, or electrical current may be used. Your therapist may also use hands-on techniques such as massage, mobilizations, or manual stretching to improve motion and relieve discomfort. Next your Physical Therapist will prescribe stretching and strengthening exercises that address any tight or weak muscles noted on the physical examination. In particular your Physical Therapist will ensure that your child’s hips and the joints of their back are moving well, as these areas work closely together. As mentioned above, if the hips are stiff, often the back takes up the slack and is required to move more, which can cause back pain. If the joints of the back themselves are stiff this will put strain on the joints and also cause discomfort. In addition, if the buttocks muscles (gluteals), which support the hips and back, are weak the back again endures extra stress. For this reason the gluteals will be focused on in regards to strengthening. All exercises prescribed will be done both in the clinic but also as part of a home exercise program. Your Physical Therapist will next teach your child how to use their core stabilizing muscles in order to support their back. Activating the deep core muscles assists greatly in supporting the back and decreasing back pain. Your child will be asked to do specific exercises for their core muscles but will also be asked to try to gently activate these muscles during everyday activities such as sitting, walking, running, or sporting activities. Carrying backpacks may sometimes be to blame for non-specific back pain. Your Physical Therapist will discuss this with your child and may ask to see the backpack that your child regularly uses. 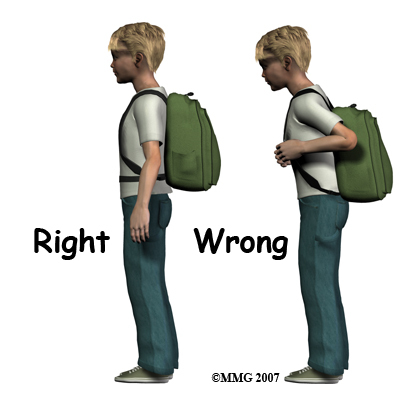 Many children these days carry extremely heavy backpacks and use backpacks that are poorly designed ergonomically. It is suggested that children wear their backpack using both shoulder straps and that if there is a waist or chest strap, that these straps also be used. When purchasing a backpack, ensure the shoulder straps are wide, padded, and adjustable so that the weight can be evenly distributed. As a general rule backpacks should not be heavier than 10% of your child’s body weight. Making more frequent trips to the locker can decrease the weight of the backpack, and packing the backpack so the weight is distributed evenly can also decrease the strain on the back. Using a wheeled backpack may be an option and should be considered if your child suffers from frequent back pain, or is recovering from an injury. Bracing may also be useful to assist in treating some conditions and your Physical Therapist will discuss if this may be helpful in your child’s case. Taping can provide similar short term benefits as a brace and may be trialed by your child’s therapist to determine if it assists with decreasing pain or improves the ability of your child to move their back. Tape can be used before investing in a brace, or in some cases instead of purchasing a brace. Fortunately most back pain in children does very well with the rehabilitation we provide at Purposed Physical Therapy. If, however, your child’s pain continues longer than it should or therapy is not progressing as your Physical Therapist at Purposed Physical Therapy would expect, we will liaise with your child’s doctor regarding the lack of progress and will ask you to follow-up with your child’s doctor as well to possibly do further investigations. Surgical treatment for back pain in children is rare. If a tumor has been discovered as the source of your child’s back pain, the treatment options will vary depending on the type of tumor found. Some tumors are evaluated periodically on a watch-and-see basis. Surgery to remove the tumor is often recommended. If radiation or chemotherapy is required, your child will be referred to an oncologist (cancer specialist). In the case of a tumor, radiation may begin as early as one to two weeks following surgery. Radiation usually lasts only 15 to 20 minutes per day for two to six weeks. Treatment options and the prognosis for many tumors have improved greatly in the past few years. Periodic follow-up visits with your child’s surgeon after surgery will be required. Repeated or different imaging studies may be necessary and any laboratory tests done may need to be repeated. Follow up may need to be on a long-term basis and is done to watch for the development of spinal deformity or recurrence of a tumor. The amount of time your child is hospitalized depends on the type of surgery required. If your child’s surgeon recommends it a Physical Therapist may visit your child in the hospital to start assisting them with gentle back strengthening and range of motion exercises immediately after surgery. Activities such as sitting, crawling, or walking are usually allowed immediately after surgery as well as activities that do not require stretching or straining of the spine, but these restrictions depend on what was done during surgery as well as the surgeon’s preferences in regards to rehabilitation. Some surgeons may recommend a short period of complete rest where minimal or no activity is done immediately following the surgery. Lifting is also generally limited during the initial recovery period. Your child will likely be required to use a brace or corset after their surgery to help with stability of the spine. Your child’s surgeon will determine how long the brace is required, but generally once the muscles have regained the strength to support the spine, the brace can be discarded. Your child may begin Physical Therapy at Purposed Physical Therapy as soon as their surgeon recommends it. During the first few appointments at Purposed Physical Therapy treatment will focus initially on relieving any residual pain that may be lingering from the surgery. Your child’s therapist may use modalities such as heat or ice to assist with decreasing any pain or swelling in your child’s back. In some cases ultrasound, or electrical current may be used, depending partly on the age of your child. Your therapist may also use hands-on techniques such as massage or mobilizations to improve motion and relieve discomfort. Next your child’s therapist will begin with range of motion exercises for your child’s back as well as their hips to ensure they regain maximum movement of these areas and can get back to normal motion of the spine as quickly as is safely possible. Any movement restrictions implicated by your child’s surgeon will be strictly abided by. If movement for your child is difficult or continues to be restricted by pain, your therapist may suggest that your child does their therapy exercises in a Physical Therapy pool where the warmth of the water and the hydrostatic properties can assist with decreasing pain and make motion easier. Your therapist will discuss this with you if they feel it is appropriate. Core strengthening after spinal surgery is particularly important so will begin as soon as possible. Your therapist will teach your child how to use their core muscles, and will prescribe specific exercises for your child to improve their core strength. They will also encourage your child to use their core muscles during everyday activities such as sitting, or getting out of bed. As they progress in their rehabilitation they will also be asked to incorporate core strengthening into more advanced activities such as playing and running. While learning to activate these muscles, your child’s therapist may use taping techniques to help provide feedback for your child and, if needed, to provide ongoing support for the back as your child moves towards doing their normal activities. Other stretches and strengthening exercises that target your child’s individual muscular deficits will also be incorporated into your child’s rehabilitation program and will be done both in the clinic but will also be required to be done as part of a home exercise program. These exercises will address any tight, weak, or overactive muscles identified in your child that may restrict your child’s back from moving optimally or may contribute to back pain in the future. Finally, if your child is of an appropriate age your therapist will discuss proper posture and alignment with your child. Maintaining good posture as often as possible can help to prevent back pain in the future or can at least decrease the incidences or severity of back pain that may arise. Slowly your Physical Therapist will assist your child in returning to their normal activities. Generally rehabilitation after spinal surgery in a child progresses very well with the treatment we provide at Purposed Physical Therapy. If, however, your child’s pain continues longer than it should or therapy is not progressing as your Physical Therapist would expect, we will ask you to follow-up with your child’s surgeon to ensure their back is tolerating the rehabilitation well and to ensure there are no hardware issues that may be impeding recovery.